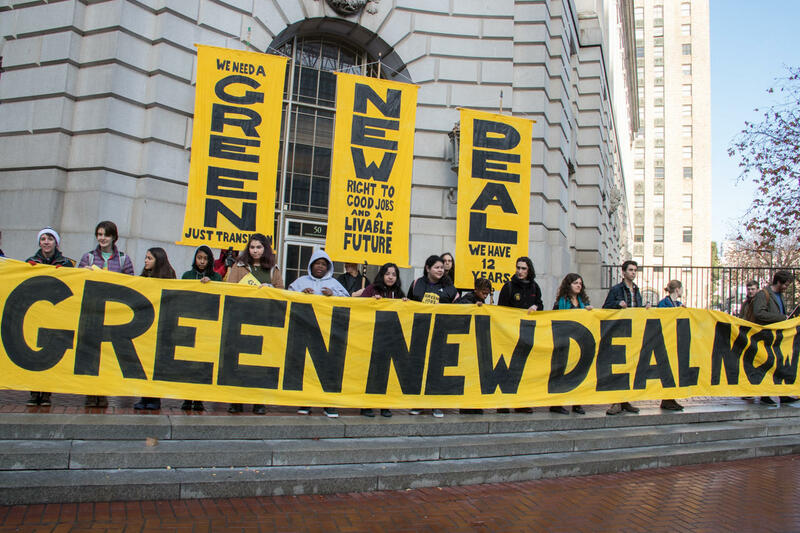 Last Thursday, the Green New Deal resolution has been unveiled to the public by Rep. Alexandria Ocasio Cortez (D-N.Y) and Senator Ed Markey (D-Mas.). The nonbinding, 10-page resolution seeks to define the grave environmental, social, industrial, and economic crisis faced by the United States (as well as the rest of the world) and lay out the foundational groundwork in order to responsibly reduce carbon emissions to zero and transition the U.S. economy to renewable energy by 2030. Necessary as it is ambitious, the resolution has won both the support and criticism of American lawmakers and politicians. As opposed to a proposed set of policies, which is what many perceived the Green New Deal to be, the resolution constitutes a preliminary framework that highlights the scope of the environmental and socio-economic challenges lawmakers must tackle, and then lays out a set of recommended goals in order to resolve them; the precise method of achieving these goals shall be deliberated upon and outlined by Congress within the next two years. One of the primary objectives of the Green New Deal is to reach net-zero emissions within ten years. Although the resolution does not specify how this goal is to be realised, it does imply that U.S. lawmakers and industrialists will have to explore carbon capping methods that are presently viewed by many as somewhat quixotic – such as carbon capture and storage (through its burial underground) and mass planting of trees across the country. What separates the Green New Deal, however, from other environmental initiatives is its emphasis on social equity. The transition to a completely green economy, the resolution proponents argue, must be done in a way that acknowledges the grave social injustices and disparities negatively affecting various segments of the population (mainly the working class and racial minorities) and seeks to rectify them. According to the resolution, the adoption of eco-friendly energy production methods will secure “good, high-wage jobs” to millions of Americans, as well as clean air and water, healthy and affordable food, quality healthcare, and decent and affordable housing. The resolution proponents argue that the full initiative will be drafted through close collaboration with vulnerable communities, labour unions, and civil rights groups. While the Green New Deal outlines goals that many would argue are far too ambitious, it is also the only document that gets America even remotely close to seriously considering how to tackle climate change and drastically reduce emissions by 2030 (after which we would have reached a point of no return, according to the IPCC). The Green New Deal has thus far been endorsed by numerous high ranking Democrats, including Ron Wyden of Oregon, a senior member of the Senate Finance Committee, and Jim McGovern, who chairs the Rules Committee, which is in charge of determining which pieces of legislation make it to the House floor for debate. The resolution has also been co-sponsored by some of the 2020 Democratic runners, such as senators Elizabeth Warren, Kamala Harris, Kirsten Gillibrand, and Bernie Sanders, who might make it a front-line issue in the primaries. In the upcoming months, Congress will be placed under scrutiny by lawmakers, activists, and pundits who view the Green New Deal as a life or death uncompromisable issue. The reaction of Democratic leaders to the resolution and whether or not they will espouse it will indicate if they once again choose to place power-struggles and politics ahead of the benefit of humankind and the Planet.